Shuffling Around (Andrew Schultz as "Ned Yompus"; 30-Sep-2012; Glulx). Testers: Adri, Anthony Hope, DJ Hastings, Melvin Rangasamy as "Gavin Myers-Leman", Hulk Handsome, Joey Jones, Wade Clarke as "John Nitchals", Paul Lee, Robert Patten, and Kevin Jackson-Mead as "Tomie Campf". Cover art: Wade Clarke as "John Nitchals". IF Comp 2012: 7th place of 28 entries. There was no real release 2, as a binary was actually released as an open Beta shortly after IFComp concluded before the author got distracted by other projects. It incorporated colored text. Additional testing: Sean M. Shore. Thanks also to ClubFloyd. Added several Last Lousy Points, 300+ nudges for right and wrong guesses, bug fixes (especially in M), and more organized random text. Shuffling Around - at IFDB. 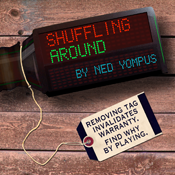 Shuffling Around - at ifwizz interactive fiction (in German).